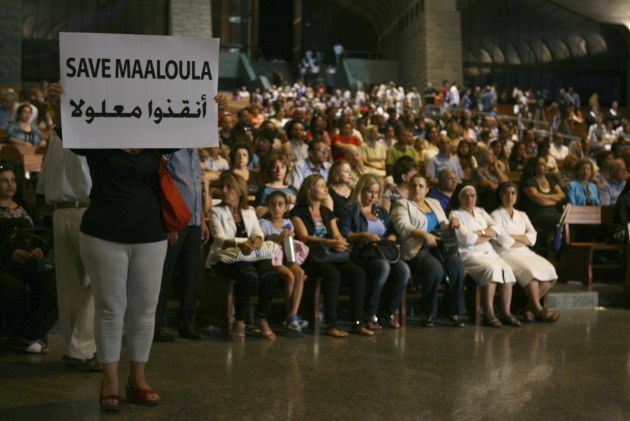 (Photo: REUTERS / Hasan Shaaban)A Syrian woman holds a banner for saving Maaloula while Lebanese and Syrian Christian Maronites pray for peace in Syria, in Harisa, Jounieh, Lebanon on September 7, 2013. BEIRUT (Reuters) - Syrian government forces launched an offensive to wrest back control of an historic Christian town north of Damascus on Monday, activists said. But fighting in an area with such religious symbolism could increase anxieties among the Christian minority, who have watched sectarian violence between majority Sunni Muslims and the Alawite minority overshadow the revolt against Assad's rule. Abdelrahman said 18 rebel fighters were killed and over 100 injured during Saturday's fighting. He could not confirm the extent of casualties among government forces. "Soon we will withdraw from this city not out of fear but to leave its homes to their owners. They were not our target. Our target was mainly military," he said. The video ends with an interview of two elderly women wearing the black garb of Christian nuns. One of the women says that the rebels treated them "very well", but the rest of her comment was droned out by the near constant sound of shelling in the background. Syria's Christian community is wary of the rising power of Islamist groups within the rebel movement but has remained largely on the sidelines since 2011, when peaceful demonstrators began protesting four decades of rule by the Assad family. Christians make up roughly 10 percent of Syria's population. A small percentage so far have taken up arms in the civil war that broadly pits minorities, in particular Assad's Alawite sect, an offshoot of Shi'ite Islam, against the Sunni Muslim majority.